The Dentist provides dental care to all age groups in accordance with the State of Wisconsin Licensing and professional scope of practice and applies diagnostic and therapeutic dental services to QuadMed patients, while making reasonable and sound assessments and treatment plans within the scope of the dental program. Provides dental care to all age groups in accordance with the State of Wisconsin Department of Licensing. Works as part of a primary care team with QuadMed staff and providers. Assures integration of patient education into all treatment phases. Advise and instruct patients regarding preventative dental care, the causes and treatment of dental problems, and oral health care services. Makes reasonable and sound dental assessments and treatment plans. 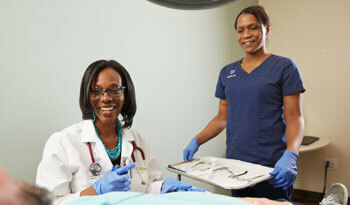 Provides diagnostic and therapeutic dental services to all QuadMed patients. Consults with appropriate providers as necessary, and makes recommendations to patients for outside referrals. Identifies special needs of patients and works with staff to address those needs. Obtains history and physical appropriate to dental problem. Reviews patient records, charts and other pertinent information. Documents encounters in an accurate and timely manner. Assists the Medical Director, Manager Clinical Operations, and clients in the planning and evaluation of effective health and wellness center operations. Responds to quality issues as recommended by the Medical Director and the Manager Clinical Operations. Participates in ongoing identification of performance and process quality improvement opportunities of the department and the organization and the formulation and implementation of actions to achieve improvements. Leads a small team of support staff. Participates as a team member with all clinical staff to assure services meet or exceed the expectations of patients, coworkers, the public, and community standards. Maintains patient confidentiality and upholds Patient’s Rights. Doctor of Dental Surgery (DDS) or Doctor of Dental Medicine (DMD) from an American Dental Association (ADA) accredited School of Dentistry. DEA controlled substances registration certificate. Healthcare information systems, such as electronic health record and practice management systems experience. We offer excellent benefits to eligible employees, including 401K and profit sharing plans, holidays, vacations, and more. Employment in this position is contingent upon successfully passing all QuadMed pre-employment, as well as any specific checks required for your access to client sites.